Logbook screen is the place where you can enter the glucose readings, insulin injections and carbohydrate amount. You can specify a category and provide an additional note to the entry. The screen is designed to be simple and allows you to enter the most used entry types at once. You can also log additional values like weight, ketones, HbA1c, cholesterol, blood pressure, pulse and physical activities. A very useful feature is the ability to track the zones on the body where diabetics inject insulin and the test sites on the fingers when you check blood sugar. Diabetes:M has a Calculator screen where you can calculate the insulin units for the meal based on carbohydrates, fat and protein intake. You can select the products and food from the categorized list and to specify the quantity. 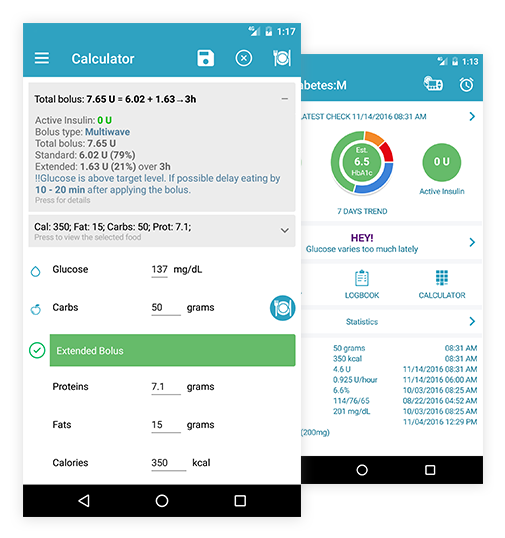 You can also enter the measured blood glucose and the calculator will determine the correct insulin dose. The input and the result can be saved to the logbook. 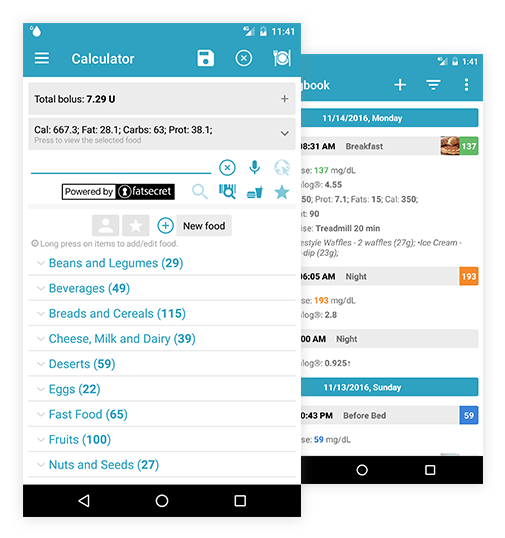 Calculator notifies you when you need additional carbohydrates or to delay the meal due to high blood sugar. Diabetes:M gives you a categorized list with most common foods and products. You can easily find and track what you eat. You can also add your own products and portions to the database, and select and filter by favorite foods. 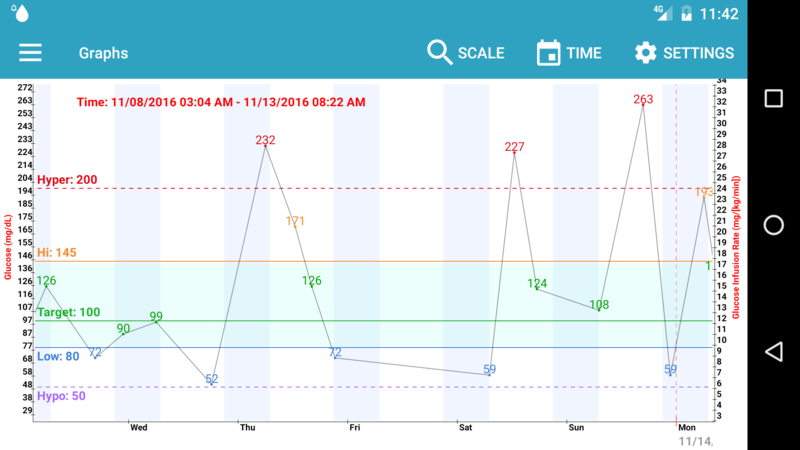 Diabetes:M can give you all the blood sugar entries as a timeline graph. You can scroll it left and right and see a particular time interval depending on the selected scale. Graph provides four zoom levels – day, week, month and year. 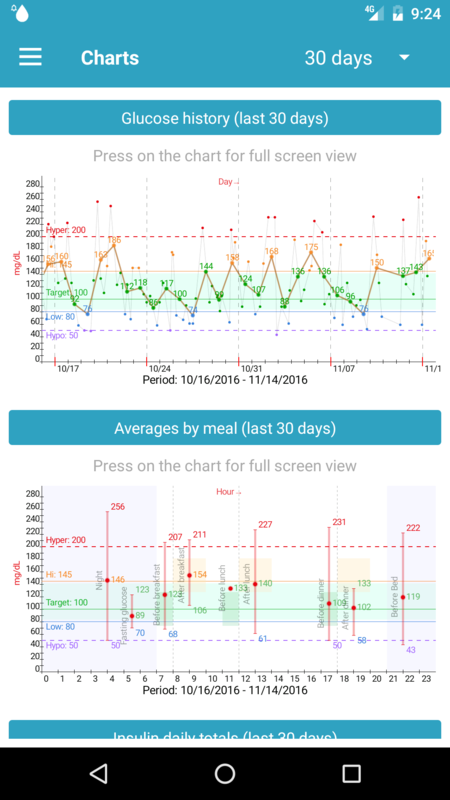 Diabetes:M gives you a set of charts and diagrams to present the data in various ways. These are displays that are organized to give you the big picture of the data at a glance. 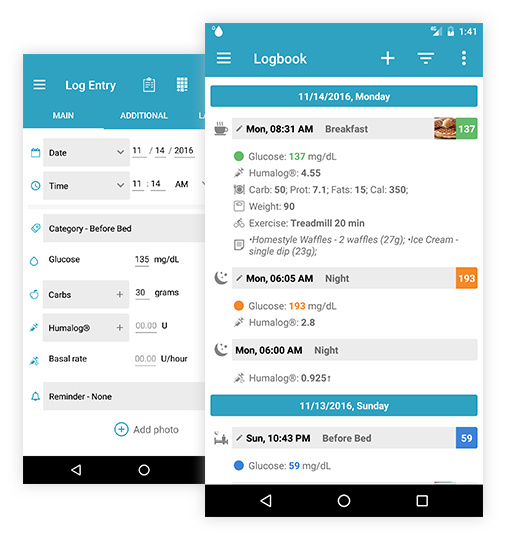 Diabetes:M allows you to generate very detailed reports and to share them with specialists. The reports can be generated in PDF*, HTML or XLS* format. 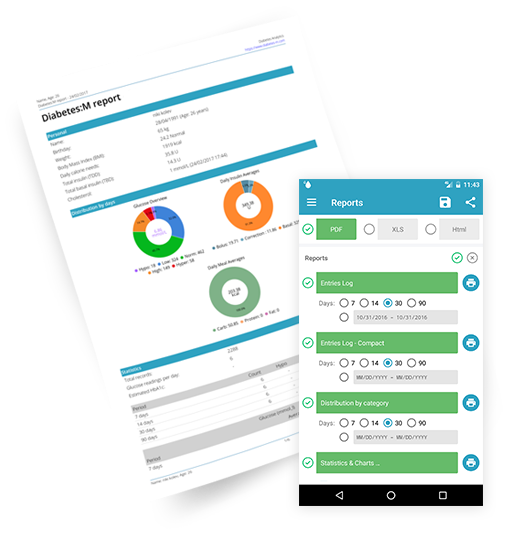 The last summary report can be configured to include most of the charts which Diabetes:M can generate. Diabetes:M pays attention to your data safety and provides various ways to backup and restore the data. You can also export data to CSV or XLS format for external analysis. 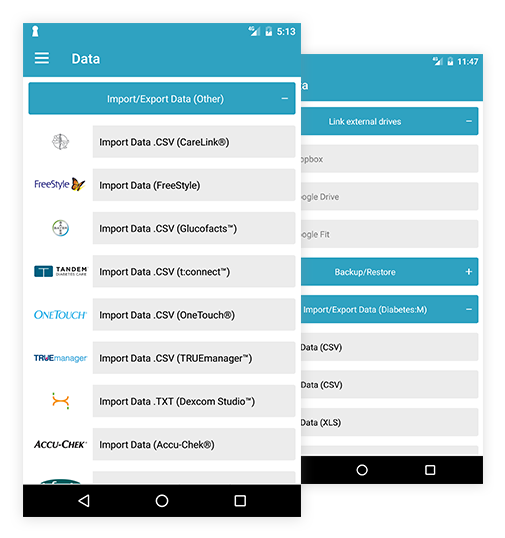 You can import existing data from the diabetes management software you use. Never forget another check with our powerful reminders system. 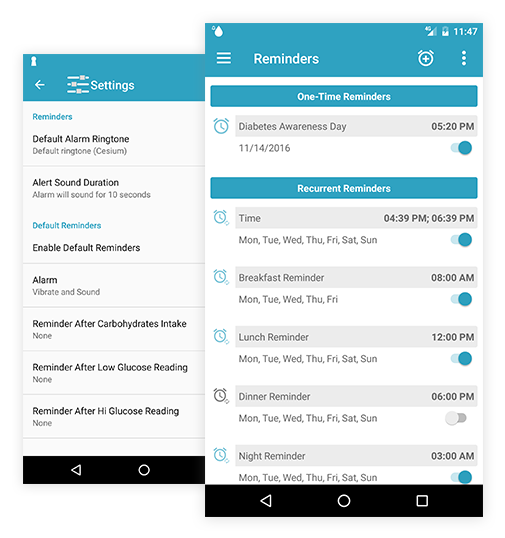 You can set both on-time and recurring reminders, and turn them on or off with a simple switch.